Jaden Smith has been getting a lot of heat since the recent release of his latest film, "The Karate Kid." (EW.com) -- What is Jaden Smith's crime? Last weekend, the up-and-coming young actor, who will turn 12 this July 8, starred in a remake of "The Karate Kid" that audiences flocked to beyond expectation and, from all available evidence, loved. Given that Smith is front and center in more or less every frame of the 2 hour and 20 minute movie (and given that his performance, as a kid who hides his sadness behind a mask of surliness, is to this critic, at least a magnetic and affecting piece of acting), I hope we can all agree that Jaden Smith's presence on screen had a little something to do with the movie's success. Yet Smith's rise has been greeted, in far too many quarters (including a number of comment boards on ew.com, like the one on my review), with bitter, gnashing resentment. This 11-year-old really has the haters foaming. Excuse me, but what the heck is going on? 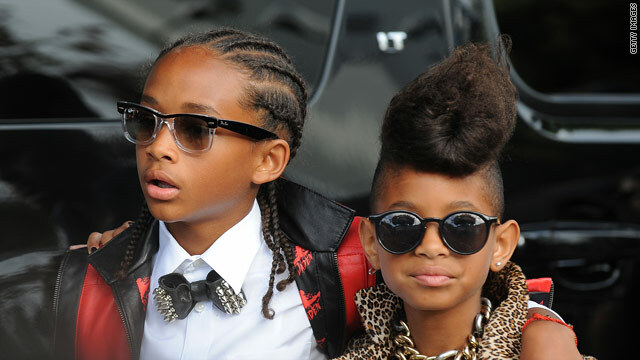 Oh, but, of course, the rap on Jaden Smith is that he's all nepotism and nothing else, that he's a kind of grouchy preteen Tori Spelling in cornrows. He's been excoriated as a bad actor (even though, just a few years ago, most viewers had nothing but praise for the appealingly feisty and precocious performance he gave right next to his dad in "The Pursuit of Happyness"). He's been called a brat, a spoiled no-talent, an ungrateful beneficiary of his lineage of stardom. He's been ripped up and down as "insufferable" for his appearance last week on "The Late Show with David Letterman." I caught up with the Letterman spot a few days after the fact, when the anti-Jaden anger was already at full boil, and so I watched it with particular attention and fascination. Here's what I saw: Smith, seated opposite Letterman, conducted himself very differently from most child actors. Usually, kids in show business know how to present themselves as cuddly pets. Smith was having none of that. Bottom line, for me: Smith was cocky as hell on Letterman, but he was also interesting. For eight minutes, he displayed the confidence to be non-ingratiating and, in the process, he seized your attention. He was brash; he acted like a Hollywood kid who truly had a mind of his own. Perish the thought! Yet in the online universe of Jaden Hatred, that Letterman appearance played as one thing and one thing only: privilege. And that, on the surface, is what the whole ragging-on-Jaden-Smith phenomenon is really all about the desire to tear down a child who enjoys the perks of celebrity royalty, even though he didn't earn them. And now he's getting a movie career handed to him! You can almost taste the class resentment, the jealousy of folks who only wish, deep down, that they'd gotten such an opportunity themselves and now want to scrawl their rage on Jaden Smith's image like Perez Hilton going crazy with his Magic Marker. Still, what's most striking, and perhaps revealing, about this particular outpouring of toxic anger is that Jaden's famous father, Will Smith, isn't just another big movie star he's one of the most likable movie stars you could ever imagine. You'd think that the general feeling about him, the nearly universal good will, would extend to giving the benefit of the doubt to his son. I know that when I watched Jaden Smith in "The Karate Kid," the echoes of his father in everything from his cool, appraising glare to the nimble speed of his responses is something I enjoyed like, say, hearing that raspy echo of Bob Dylan in Jakob Dylan's voice back in the "One Headlight" days. It's not as if this sort of situation happens every day; what would be so wrong with giving the son (or daughter) of fame a break and simply enjoying it? It's hard to shake the feeling, though, that too many people are trying to turn Jaden Smith from what he is, which is an insolently charismatic and hard-working young actor, into a focal point of ill will over issues of class, fame, money, and yes, I'm going to say it race. For let's be honest: Doesn't all the grousing about how Smith is "arrogant," etc., carry a special, ugly tinge of rancor? Doesn't the complaint that he's too big for his britches come painfully close to saying that he doesn't know his place? What do you think? Has the anger at Jaden Smith gotten ugly? What do you believe it's really about? And who out there likes him as an actor as much as I do? Now that he truly does appear to be on his way to stardom, what sort of movie should he do next? See full article at EW.com.